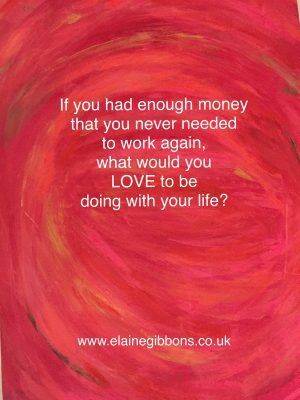 If you had enough money that you never needed to work again, what would you LOVE to be doing with your life? This can be a great question to ask yourself to see how close you feel you are to your life purpose, to your own personal path in life. But your true happiness will come from within yourself when you attend to the deeper questions – what would you really LOVE to be doing with your life? What brings you happiness right now? What do you think having more money or things will bring into your life – and how will this bring you happiness? Once you know what you think having more money will give you, you can start working on bringing more of the essence of this happiness into your life from today. But focusing on creating happiness in your life now, you will start to feel happier and grateful and blessed. This will then raise your energy field and more of what makes you feel happy will automatically be drawn to you! Creating change on your inner self and focus is the place to get started! Do it now!